$20,000 CAD in Prince Rupert, Canada from August 2015 onwards. After months of contemplation about what to do with Teleport next year we have made the very hard decision to put her up for sale! It's not an easy decision to make, we really have been 'living the dream' for the past 5 years being able to take months off work each year and sail her that little bit closer back to home. However, we dream of other adventures too, like kayaking around remote islands, cycling across counties or hiking through jungles, but every year all our spare time gets devoted to our little teleport (which we love dearly) but it's just time for us to move on and do other adventures as well as focus on our growing business for a bit! Down the track, we intend to find a slightly bigger junk-rigged sailboat to get (big enough for a family, perhaps? 'Teleport' is one of only six North Atlantic 29's around. Designed by English offshore racing designer Angus Primrose and Blondie Hasler himself, this 29 foot junk-rig (perfect for cruising - see our website for the advantages of junk-rigs) was lovingly built by Jim Creighton, in Canada in 1988, and then rebuilt by Chris and Jess Bray in 2010, who then successfully sailed her up the coast of Greenland and through the Northwest Passage in 2011-12 (over the top of Canada and Alaska through the Arctic) through some major storms and down through the dreaded Bering Strait and Aleutians, down the coast of Alaska to Canada (2013-14), proving her worth as a strong, reliable, and safe go-anywhere cruising / expedition boat. Though only 29 feet long, she�s got minimal side-deck which means the volume inside down below is much larger than you�d expect. She also has a small-looking cockpit, but this is because the North Atlantic 29�s also have an awesome mid-cockpit � a separate, sealed semi-cabin from which you can operate the boat out of the weather (even with heater outlet). This mid-cockpit also doubles as a great �mud-room� or area to strip off wet gear etc out of the weather but before having to wet everything down below. Though originally designed to sleep 6, we re-built her to comfortably sleep two (ok maybe 3), but instead kitted her out for extreme, high-latitude cruising � not only creature comforts like bookshelves, sound system and ducted, thermostat controlled, electric-start heating, but also in terms of brand new ropes, top-of-the-range navigational and safety gear, full AIS transceiver, oversized rocna anchor, custom made expedition dingy with hypalon tubes and 6hp Yamaha outboard motor (combined worth over $6,000 USD) etc. There can be few small boats so capable or so kitted out. Have a read of the huge list of included gear below! This really is a go anywhere, anytime, ideal couples cruising yacht, or equally suited to a solo sailor (particularly with it�s junk-rig). 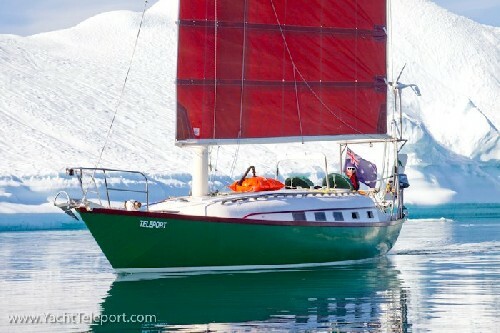 Visit www.YachtTeleport.com to watch the videos and read all about this amazing little yacht and where she�s been. As you�ll see, we�ve been 100% open and honest all the way through our journey in terms of not trying to hide any of the problems we�ve had or things we�ve had to fix on the boat. See our note on �overall condition of the boat� below. Average sailing speed: We work on about 5 knots for passage making. �	Vesper marine AIS watch mate � 750 RX. AIS transceiver with dedicated screen and independent GPS and VHF antenna. Provides a completely independent backup system and back up for GPS. �	SABB, 8hp, 1 cylinder, hand start diesel engine. �	Simple to repair and built like a tank. �	100L flexible �turtle-Pac� long range fuel tank that fits neatly on deck under dingy to be easily syphoned into tank as needed. �	50L Flexible �turtle-Pac� fuel tank in the bilge. �	100L of plastic diesel jerry containers. �	8ft custom designed and made dingy to fit perfectly on deck. Hypalon tube, fiberglass hull RIB, with extra abrasion pads, handles, tie down points, and extra strong and durable. Also comes with �feather light ores�, seat, anchor, chain, fuel tank. �	Yamaha 6hp outboard engine, new in 2010, in very good condition, well maintained, reliable and only used for a few months during the summer. �	Plus large fishermans anchor, don-forth anchor and extra chain. �	Webasto � Marine air heater system (Airtop 2000s) � diesel tapped from the main fuel tank, ducted into the mid-cockpit, saloon and heads. Electric start and with thermostat. �	Tools � complete socket set, spanner / wrench set, drill, soldering iron, crimping took, torque wrench. �	Hawkins pressure cooker and assorted pots, pans, kettles, utensils, plates, bowels, cups and mugs. �	Comfortable bedded single sea-berth that folds down into a comfortable double bed for two. �	Mast: Lots of paint scratched off where the battens rub, and a few minor cracks and delamination of the fiberglass covering. All indications are that the wood is in good condition underneath. �	Deck & coach roof � In 2010 we applied a whole new layer of fiber glass to the deck & coach roof for extra strength and sealing. Minor signs of wear and tear are starting to appear with bits of paint flaking off, but all still good. Note that this extra fiberglass layer was not faired smooth on sheet edges etc, so if one looks closely, you can see where some sheets overlap etc. �	Keel: There was a delaminated region on the starboard side of the keel when we bought the boat in 2010. We had a fiberglass expert company work on this for us, and first they drilled several large holesaw holes through the fiberglass to allow the region to dry out / breath (it was wet behind), but it was evident that more work was needed so they then removed this section of the glass to inspect it, and found it was delaminated because of a slight casting pocket in the metal of the keel when it was cast, which had been filled and faired using some kind of filler, and the fiberglass hadn�t bonded well to that filler when covered. So the fiberglass expert scraped out all the filler, and replaced it was a polybond super strength epoxy, and re-attached and sealed the section of the fiberglass. All good. Over the following 5 years, when we pull Teleport out to store for the winter, slight rust stains weep through around the edges of the original holesaw breather holes. In 2014 we repaired a small crack in the fiberglass on the port side of the keel. �	2x Spinlock Deck vest � 150N automatic life jacket with integrated deck harness, Size �1� and Size �2�. Hardly used and as new. They are worth $450 USD each, we will sell them for $350 USD each, and we�ll throw in a spare recharge kit. �	2x Adult Oversized insulated dry suit / survival suit � New was $400 USD each, we will sell them for $250 USD each. Import Tax and Sales Tax will depend on the nationality of the buyer, we'll help work with the buyer to figure out what taxes we each need to pay. All the best. I'd love to see more videos. They Don't have to be boat relate. I can't think you guys just sit home all the time. Looking forward to seeing more of your adventures in the future. I was recently introduced to your utube posts only after seeing your ad for Teleport on Gumtree. I have found your utube posts absolutely wonderful. Have you been sailing at all this year? Best Wishes. Hi worldtravelers, like the rest, i like to read more about your next adventures..I make a lot of nice video's and perhaps its a idea to let us peak into your lives. Whit or whitout childeren..LOL..All the best for now and hope to see or read something form you both..Have a good live..
I\m originally from Halifax and remember Teleport at AYC. Thank you for giving her love and the adventure she so deserved. Wishing her another fantastic new home. Wish I could bring her to Denmark and sail her back to Nova Scotia. Looking forward to you new adventures.